Sometimes I'm in the mood for a Near Eastern pastry made of many layers of paper-thin dough with a filling of ground nuts, baked and then drenched in a syrup of honey and sometimes rosewater. ...other times I might require a close-fitting, knitted cap that covers the head, neck, and tops of the shoulders, worn esp. by mountain climbers, soldiers, skiers, etc., you know? What? We call ourski masks baclavas. Army issues those. We need them for the EP because of the dust storms/Mexicans. He, he, he. As an aside, our across-the-road neighbor is of Greek descent and makes AMAZING baclava, which he graces us with each Christmas. Mmmmmm. The word for the mask is a baLAclava. Wore them all the time in Russia. Russians like baclava, though! 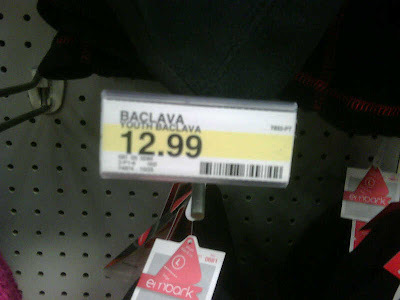 Thanks, Natalie--I always pronounced it BalaCLAva. Now I will correct myself and be even more awesome! "What did she say it's called? Baklava? Isn't that a dessert or something? Some kind of food?" "Dude, that's what I heard her say. 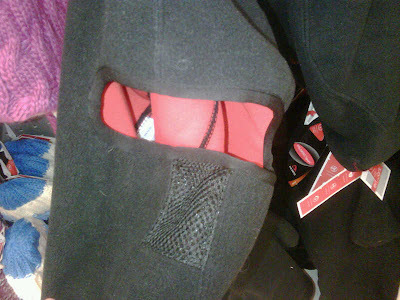 Just put it on the tag."